Would you recommend librarianship? The results! So, would you? Most people have an automatic response to this question - many people will say 'yes' straightaway because they love librarianship and know it is largely misunderstood, while others will say 'no' straightaway because they've had a rough time of it. What I'm interested in is, would you ACTUALLY recommend it to someone, who might then act on your recommendation? I was asked about entering the profession in an email recently, and my reply sounded, I realised as I re-read it, quite negative. That's because I think you have a responsibility when someone wants your advice to actually think about what you're saying! And there's a lot to be said for not-entering librarianship (by the end of the decade who knows how many worthwhile jobs there will actually be, for example) just as there is a lot to be said for entering it (it's ace). I sometimes worry that we're so busy promoting our value and the value of the profession, that we blindly tell everyone to become librarians even though they might not thank us later if they become one. So I asked Twitter, a brief and unscientific 24hr poll. 133 responses. It started off more or less equal, with recommending just about edging ahead of not doing so - when I tweeted something to this effect, the vast majority of the subsequent votes were in favour of recommending it. So I don't know if that's because people who hadn't previously voted felt moved to 'defend' the profession, or just a coincidence. So of the 133 respondents, 72% would recommend this profession of ours. Here's the split by country. This started off VERY interesting because the US had 100% of voting no, but then every single other vote from that country was yes so it ended up being a landslide in favour of recommendation... Ireland, from this miniscule sample-size, doesn't look much fun. So would you recommend librarianship to a friend? I'd like to hear what you think in a comment. you have to fork out a fortune to do the MA but, if you think about it, the difference between librarians with the Masters and those without it is very rarely the Masters. It's a qualification that is both essential and of questionable value. .
the people you work with are NICE. .
For me, my day to day environment is the most important thing. I'd rather live in a smaller house in a nicer area than a grand house further away from town. I'd rather work in a nice room with nice people who will understand if I need to go home and pick up my daughter from nursery, than have a high status job with a company car a career trajectory ending in a six-figure salary. My job is challenging but fun, it suits ME better than any profession I could imagine. But everyone is different, and I'm already entrenched in this profession, whilst at the same time developing the skills to keep working if this profession ceases to exist - that's a very different situation from advising someone to just now start applying for entry-level library posts with a view to doing their Masters in October 2014 and maybe, just maybe, getting a job they really want in 2017ish. Where do you stand on this? What would you add? Tagged: library careers, library industry, library profession, library sector, pros and cons of librarianship, should I become a librarian? Stealth Advocising: creating material for library advocacy, but packaging it in something of intrinsic awesomeness so that non-librarians will be interested in it anyway - thereby extending its reach and escaping the echo chamber. 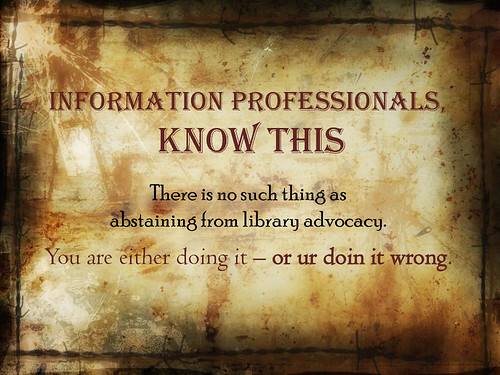 Stealth advocising is the Trojan Horse of library advocacy. Recently I've been thinking about the 'libraries and the echo chamber' problem a lot. (What a surprise!) Coincidentally, I also read that Lorcan Dempsey thinks the 'found flickr' style of slide-deck (which is what I normally do - I know it as 'zen-style slide-decks': full-slide images, one point per slide, the image being a visual metaphor of some kind for that point) is dead or dying. Then I saw NoteandPoint, a site devoted entirely to showcasing lovely presentations. The slide decks on there were sooo far ahead of what I normally do, it really made me think. All of this came together with me thinking a: I need to experiment with a different style of slides, to keep ahead of, or at least up with, the game, b: I've been meaning to contextualise my 'essential advice for new professionals blog post' into a slide deck for ages because it would be easier to digest and disseminate that way and c: wouldn't it be cool to make a deck so attractive it gets onto NoteandPoint because of its aesthetics, and then surreptitiously rights public misconceptions about librarianship at the same time! It's stealth advo-cising! Subliminal advocising, even! Because people will be viewing the presentation as a sort of cool object of PowerPoint beauty, without realising they're actually absorbing library advocacy! W00t! This idea could apply to a lot of things. Make something which is cool enough of itself for people to want to share it, and it just happens to be about libraries too. What would result, if it worked, would be huge reach beyond your normal sphere, and people beyond the echo chamber learning about libraries. A good example of this in the past was when LibraryMan and David Lee King's Library 101 video got onto BoingBoing - that took more resources to create than most of us could realistically aspire to, but ANYONE can make a slide-deck. Last week I created my slides, entitled If you want to work in libraries, here are ten things you need to know. I prioritised form just as much as function - this meant compromise, such as not saying as much as I wanted to in some slides, and dividing one slide up into 2 different ones because I only had 9 main slides. I wanted 10 because 'here's 10 things you need to know' is snappier than 9 - titles are really important. I made it short and easily digestible. I found a nice texture from Flickr (CC, of course), cropped it and re-coloured it to work as the background. And I used icons from the newly discovered icon-finder site (thanks Phil!) to be graphics in roughly the same place each slide. The end result was a deck built for echo escapism - it is pretty, and although there are compromises on content they are necessary to help it achieve wider dissemination - less stuff, but seen by many more people, = #win. It's concise, honest, makes important points I'm always making, and will hopefully put off as many people as it entices into librarianship. No point in people entering this profession labouring under misapprehensions. The combined reach of those Twitter feeds alone is over 6000 followers, NONE of whom follow me and so were inaccessible to me otherwise. And all I did was just ASK them to tweet it - that's all there was to it! Why have I never done this before? The Prospects Twitter person in particular was really helpful and engaging, and got my feedback on other stuff they were doing online at Prospects, and tweeted links to my Essential Careers Advice post and my Prezi on libraries and technology. The Slideshare featuring thing is amazing, because every time anyone goes to the homepage they can see an attractive presentation, check it out, and are fed pro-library propaganda through a straw while they do so... As they said in the email screen-grabbed above, they receive thousands of uploads each day - the only way they even know my presentation existed in order to put it as a Feature on the homepage was because it got into the Hot on Twitter section as one of the most tweeted about Slideshare decks in the world for that morning so,thank you to everyone who tweeted and re-tweeted the links! The pictures above show just the #echolib busting stuff - it was also picked up on by loads of library people too and I'm really grateful. Another thing worth noting is that, at the moment, if I type 'I want to work in libraries' into Google, the first four entries I get are this presentation. (Same with typing in 'if you want to work in libraries'.) I know Google personalises results but even so, that's pretty good - I'd rather people got my opinions on the truth of working in libraries than some out-of-date stuff that perpetuates the misconceptions, stereotypes and so on. At the time of writing, just 24rs since being uploaded to Slideshare, the presentation has been viewed 2611 times, linked to via bit.ly 345 times, embedded in 18 people's sites and blogs, tweeted 69 times, downloaded 13 times, shared on Facebook 48 times, liked on Facebook 66 times, favourited 10 times on SlideShare and even received 7 votes for Slideshare's World's Best Presentation Contest 2010! To put that in context, the next most viewed presentation I've ever submitted to Slideshare has less than 1000 views, and that's EVER - let alone in 24hrs. So stealth advocising undoubtedly increased my reach exponentially, and hopefully it enlightened many of those new viewers as to what libraries are all about.